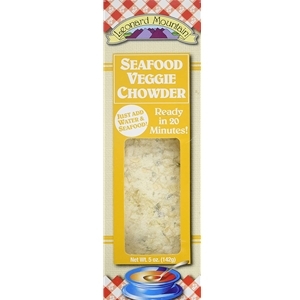 For all you seafood lovers – here you go – grab your favorite delectable tidbit from the sea and add it to Leonard Mountain Seafood Veggie Chowder. Add some water and in about 20 minutes – (less time then your slicker will take to dry off) you will have a fine bowl of lunch. Add contents of package to water. Bring to boil, stirring to mix. Potatoes, red and green bell pepeprs, tomatoes, onion, carrots, celery, sweet corn, sweet peas, non fat non dairy creamer, soy, wheat flour, lactose, maltodextrin, sodium caseinate (milk derivative), salt, black pepper, parsley, garlic, turmeric, caramel color, silicon dioxide added to prevent caking.